Our first post is an interview with one of the key figures in European cinema. 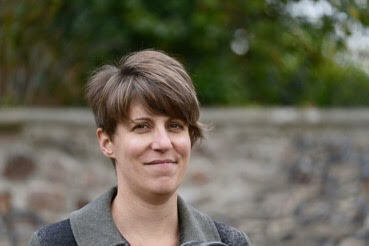 Maddy Probst is both Cinema Programme Producer for the Watershed, in Bristol, UK, as well as VP of Europa Cinemas. CJ spoke to her to to give us some context on innovation around the European cinema scene. Maddy Probst: Innovation can be all to easy to frame within technological innovation and there are many examples of this from recent developments in picture and sound quality, improved searchability, web user journey and more sophisticated data capture to tracking and social media promotions. Technology has also helped improve access for Deaf/Hard-of-Hearing and Blind communities with Descriptive subtitling and Audio Description. However, some of the best examples of innovation in cinemas are in the analogue world of addressing audience diversity and inclusion. I would point to co-curation as a way of working with film, audiences and cinema to generate a more inclusive and community based experience and resource. With an ever increasing abundance of content available across platforms, editorialisation, eventisation and participation are becoming key to developing audiences for diverse films. These are areas where cinemas can play an important innovation role. Maddy Probst: Digital and online technology are allowing cinemas to be more fine tuned and granular when connecting audiences to film (subject, style, genre) through more sophisticated use of data capture, segmentation and analytics. This translates into a more focussed form of direct marketing as well as opening up new ways of listening in and creating opportunities for deeper engagement and discussion around film. Social media have become indispensable in connecting the venue and audience with the online global chatter around films and their ancillary elements. The more commercial end of the sector are investing in sophisticated customer relationship management tools. Agile development is how we approach this at Watershed; we keep evolving a bespoke approach as to how customer data can help us monitor and develop our offer and have invested in staff capacity in this area. Online, we try to create and track audience focussed digital content that explores audiences’ interests, behaviours and needs in order to create meaningful interactions. Data analysis helps us be responsive; “knowing” rather than “thinking we know”. However, this can challenge for smaller sites that don’t have the capacity to invest in sophisticated CRM systems or the staff capacity to work out what the right questions are and analyse the data in a way that is useful. Maddy Probst: The core of the cinema experience is the film on screen in a dark room with good picture and sound quality. More thought is now going into the part before and after the screening. Audiences connect with films way before they see it in a cinema; we have to think about how we can be part of that connection. When they leave the film is the important part of the experience, whether it’s sharing the pleasures of the film experience with friends or engaging with discussion about issues the films raises. The social spaces of cinemas have become ever more important in this before and after the film moment and so has the role of the cinema in being active in that space. Maddy Probst: Opportunities for young people to engage whether that’s through making and showing their own content, being part of an ambassador scheme, getting opportunities to discuss, write or vlog about films or curating their own events or meet-ups seem to be key even if the connection to film watching at the cinema is not instantly made. It’s about staying relevant to new generations coming through and being inclusive. There is also increasingly a recognition that price is a barrier for younger audiences. Reduced rate ticket offers and generic marketing campaigns specifically aimed at young people seem to be working, as is the case at Watershed. Maddy Probst: I would like to congratulate Kinodvor, in Ljubljana, Slovenia, particularly for their work with young people; most recently Kinotrip – an ambitious initiative, which brought together a group of young people to plan, launch and run an international film festival, aimed at younger audiences. The cinema itself is also the head of Kino Mreza, a Slovenian Art Cinema network and was the first Europa Cinemas network member in Slovenia to go digital. I initially came across their outstanding work at one of Europa Cinemas Audience Development Lab in Bologna and we have since stayed in touch and visited each other’s venues. 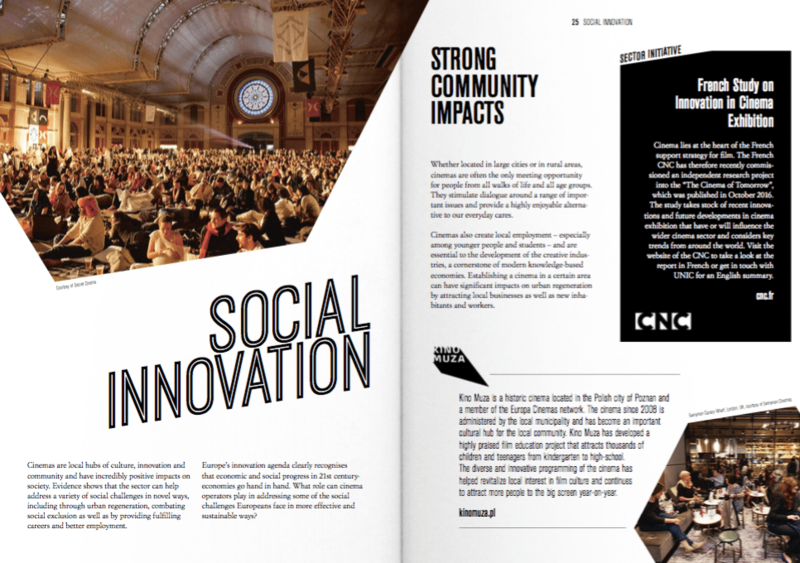 Social Innovation – sample image of one of the three sections (Creative Audience Engagement, the Big Screen Experience and Social Innovation) from the UNIC ‘Innovation and the Big Screen” report. 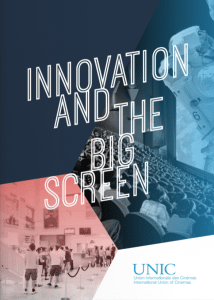 CJ: Do you see trends in innovation for cinema across Europe? Maddy Probst: One of the trends I have noticed is a recognition of the value of networks and collaboration regionally, nationally and internationally, for example, including Kino Mreza and more recently the BFI Film Audience Network in the UK as well as more established international networks such as the CICAE and Europa Cinemas. There are interesting examples of added value in terms of advocacy for the sector, skills development, sharing expertise, collective bargaining and closer collaboration between distributors and exhibitors. There is an increased interest in the potential for getting to know existing and new audiences whether that’s through loyalty card schemes, box office data analysis and more sophisticated customer management tools. There is also increasing interest in experimenting across platforms particularly from exhibitors that have a distribution arm. For example, Europa Cinema Award Entrepreneur of the Year winner 2014 Ivo Andrle (Kino Aero, Aerofilms) in Prague in the Czech Republic is doing amazing work around creating cinema experiences for all ages as well as experimenting across platforms with their own VOD platform Aerovod. CJ: Do you expect that cinema will survive well into our new century? Maddy Probst: Yes, of course! The social and communal elements are the DNA of cinema. Sure, its position at the top of the film business food-chain is looking increasingly parlous but cinemas will redefine its unique position alongside the many varying opportunities to watch films. CJ: Where do you see specific opportunities and/ or challenges for smaller independent cinemas as well as larger theatre operators? Maddy Probst: There is now not only an abundance of films being made and released (some 900 in the UK in 2016), there is also an increasing abundance of ways in which audiences can consume them. This makes it a challenging context for all cinemas. In the UK, foreign language films and smaller independents deemed “risky” are having a particularly tough time; a pattern which has been accelerated by this abundance and a programming shift to more “certain” commercial titles. However, in an increasingly complex world, many people are looking for distinctive curated content and for deeper, more thoughtful engagements with contemporary ideas, culture and society; something which the independent sector is ideally positioned to offer. This will make the diverse films we screen, the communal space and the invitation to meet and discuss all the more valuable and important. For larger exhibitors, their capacity to deliver range to audiences is one of their great strengths. The high levels of investments needed to keep up with the technological developments and audiences’ desire for the thrilling experience will be a challenge. Maddy Probst: A way of dimming emergency exit signs in cinemas whilst the film is on……. 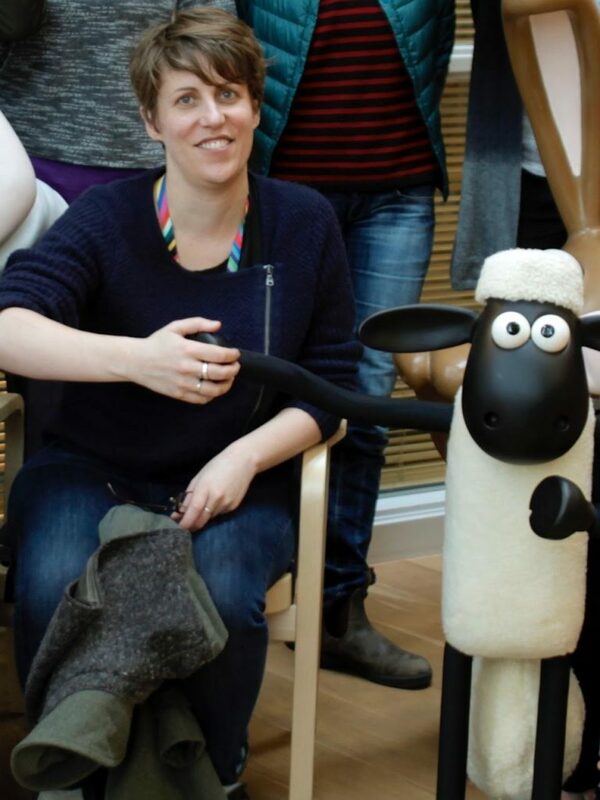 Maddy Probst and Shaun the Sheep.